This A Penny For Your Thoughts Body Cream works wonders for dry, sensitive and problematic skin (such as eczema). Have you tried everything for your dry skin? 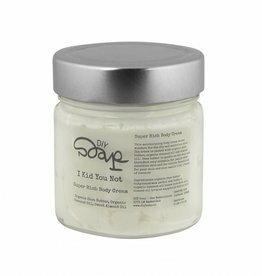 Then try this extremely nourishing, creamy, delicious body cream with lavender. This cream is packed with organic shea butter and almond oil. In addition, we mixed pure essential lavender oil through the body cream. Because the cream has an airy and creamy structure, it is easy to spread. Beneficial for your skin and smells wonderful like lavender! It's possible that the cream contains small pieces of shea butter. These melt in your hand when you apply the cream. Are you curious how you can make a comparable cream yourself? Then check out our Rich Body Cream DIY package. This package contains the ingredients and a manual to make the cream yourself. 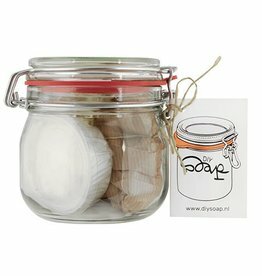 This cream comes in a beautiful glass jar with a screw cap. The main ingredient of this cream is shea butter. Shea butter is rich in vitamin A and E and is very moisturizing. In addition, shea butter has a protective effect with mild antibacterial and anti-inflammatory properties. Shea butter is very soft to the skin and has a high content of healing properties. In addition to organic shea butter, the cream contains almond oil and lavender oil. Almond oil regulates the moisture content of the skin and reduces skin irritations. Lavender oil is an essential oil that has been successfully used by humans for thousands of years. It is an especially soothing and pain relieving oil, that you can use to treat eczema. The combination of these three ingredients ensures that the cream is very suitable for people with very dry, sensitive skin and skin problems such as eczema. This cream can be a good way to reduce eczema complaints. By applying it once or twice a day (in the summer perhaps less) you can achieve the best results. It is important to realize that the cream does not make eczema outbreaks disappear straight away. This cream works more preventative. Keep on applying the cream and the chance that the eczema will come back becomes smaller. Organic shea butter (Butyrospermum Parkii nut butter), almond oil (Prunus Amygdalus Dulcis oil), lavender oil (lavendula angustifolia oil). Make your own 100% natural body cream with this DIY package. 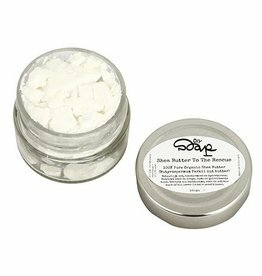 This organic Shea Butter To The Rescue is your lifesaver when you suffer from dry / chapped skin or dry hair.